I feel really bad about not updating this blog for so long. Being a good employee and good student has really been taking most of my time. So I’m going to just give you all (LOL!) a quick update on the new stuff I’ve been listening to since the last update. 1. Mariah Carey,”Memoirs of an Imperfect Angel“. Mariah, or Mrs. Cannon, keeps the winning streak going from 2005’s “Emancipation of Mimi” to her current stunner which is actually the best of her current albums. Working with just one production team, Tricky Stewart and The-Dream, and putting together a cohesive story with amazing vocals and great and funny lyrics. Mariah seems so at home on the kiss-off songs “Up Out My Face” and “It’s a Wrap”, but is also able to switch it to a more vulnerable vocal on “Angels Cry” “Languishing” and her Foreigner cover “I Want to Know What Love Is”. In just sticking to one vibe and one story Mariah pulled off probably the best album of her career. 2. Zoot Woman, “Things are what they Used to Be“. I first found out about this Electronica/Dance group when I was doing research on Stuart Price, producer and remixer for acts as diverse as Madonna, Gwen Stefani and The Killers. Price is the mastermind of a few different groups, and Zoot Woman is the closest to a legitimate vocal group. This album is their third and is actually a great sonic experience. This album has a few misses, but the overall vibe and production on this album save it from completely falling apart. Album opener “Friend of Mine” as well as “Lonely by your Side” could easily become global hits. While “Saturation” and the calming stunner “Blue Sea” help seal this album as a winner. 3. Kid Cudi, “Man on the Moon: The End of the Day“. The newest back-packer rapper backed by top Hip Hop names Kanye West and Jay-Z. Seems familiar? (Lupe Fiasco anybody?) Cudi has seemed to follow the same story coming up, but he is actually delivering. Not to keep a comparison going, but Cudi suceeds in his debut because he seems like he’s not scared to take risks, unlike Lupe who’s debut was relatively safe (with the result coming off as boring). Cudi’s debut is a nicely strung together story of the Lonely-Loner, narrated by Common. There’s a few times where Cudi tries to go a little too mainstream (“EnterGalactic” “Simple As”), but there are true star moments throughout this whole album. And a true commitment to the concept of the album, and also the rare case of vulnerability in delivery. A Very Promising debut album. 4. Mr Hudson, “Straight No Chaser“. Mr Hudson’s single “Supernova” had been burning up my iPod all summer, and than he popped back up on Jay-Z’s “Young Forever”. His album doesn’t drop in the US until December (which I’m guessing is because they are trying to cross-promote with that aforementioned song. I could be wrong) but was released in the UK a few weeks ago. I was really excited for this album, and there are times on this album where that excitement was justified. “There will be Tears” is an amazingly weird Electronic/Pop almost Trip Hop concoction that is actually very heartfelt and emotional. “Stiff Upper Lip” is a surprisingly laid back and soothing break-up song, and “Learn to Live” is a fantastic 80’s homage. However, there seems to be alot of desperation in getting a mainstream hit. “White Lies” the albums second single and the albums title track come off as a little phoney in delivery (“I was just playin’ girl” and “we don’t waste our time on Fake Thugs”… hmmm), but still have great production behind them. Another complaint is that it’s sometimes too all over the place and could have used a better sequencing job. Having said that, it’s mostly passible and I’m sure it will grow on me the more I listen to it, which I plan on doing. 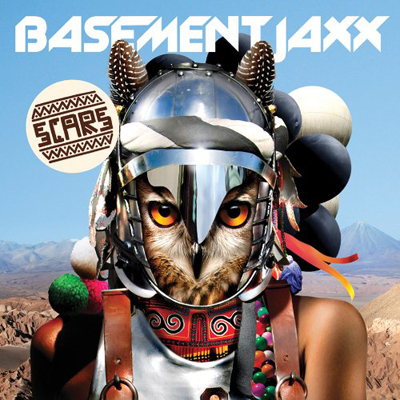 It seems like every time, I get excited for the new Basement Jaxx album and when it comes out I’m slightly disapointed. Their first two albums “Remedy” and “Rooty” were flawless, “Kish Kash” was about half and half and “Crazy Itch Radio” suffered the same problem of being way too much. Luckily the duo have calmed down a bit in their frantic production. In all honesty, it’s the times when they get a little too frantic on this album that are the worst of a pretty okay album.The best moments are when they really slow it down, which on those past two albums were the best moments of their careers (“If I Ever Recover”), and they have some amazing moments like that here with “A Possibility” “D.I.S.tractionz”. Even on some of their more traditional housers they show restraint with their effects box to make some great cuts like the first single “Raindrops” “Feelings Gone” and “Gimme Gimme Somethin True”. All in all this album is a step back into the right direction for the duo and I’ll have some justification in being excited for their next album.